Cleanflow Systems has recently merged with a US company, and competitor in the large pipe inspection industry, Redzone Robotics. As part of this merger a $US 25 million investment was made by ABS Capital Partners Inc., a leading growth equity investor. With an increased US-based sales force, Cleanflow Systems has invested more in research and development and expanded manufacturing including outsourcing to members of the cluster. PowerShield is successful with its innovative battery monitoring product in major data centres in North America and Europe. In North America the Powershield system is being installed in one major data centre with over 4,000 batteries and 6 other medium to large data centres and in Europe installations are underway for an international bank with over 4,000 batteries. Another cluster member has been assisting with new product development. Define Instruments now has distributors in South Africa and is looking at opening a branch in Johannesburg. The Define Instruments simple and easy to use transmitters and wireless devices have enabled it to increase exports tremendously to Australia and South Africa. They have grown this year by 45% and employed 6 new people. Of particular value in this expansion has been the exchanging of international electronics market information with another cluster member. Compac Sorting Equipment successfully tendered for a $US15m contract against strong competition to design and develop a Hi Tech sorting and packing line for the world’s largest citrus company. Compac will be building a sorting machine the length of a rugby field that will sort approximately 2.7 million mandarins an hour and will run 20 hours a day during the citrus packing season. Compac is hiring more staff such as project managers, designers and assembly staff to provide extra capabilities and capacity. Autogrow Systems won the ANZ exporter award in the Business.govt.nz Flying Start competition and is using the prize to fund a trip to China for the official opening of a large new farm using Autogrow Systems horticultural automation equipment. Revenue is forecast to rise dramatically over the coming years with a new product range including a revolutionary greenhouse control system and new distributors. Autogrow Systems collaborates with other cluster companies in marketing, governance and technical areas. Senztek, who manufacture energy management and control technologies, has tripled the number of customers to whom it sells over the past 12 months and has entered into two potentially large OEM deals including a global opportunity. Senztek has just released a new range of innovative solar differential controllers to be known as the SolaSmart. Senztek has successfully engaged with several cluster members in technical and market development projects. QuickCircuit offers component sourcing and procurement, design for manufacture, electronic board manufacturing and product final assembly and testing. QuickCircuit has experienced excellent growth and will be adding another 20 staff before April 2012. QuickCircuit’s customers include several high profile companies, as well as many start-up and emerging companies that have innovative ideas and products. It has engaged strongly with other cluster members to improve product development and to provide quality control and testing services. Fero is an integrated electronic and wire technology company that provides services for electronic manufacturers. Fero has collaborated with many of the cluster companies to enable new product development and manufacturing including projects to develop a microbrewery and a research submarine. As a result of the cluster the CEO of Fero has joined the Advisory Board of another cluster company. ICE AV Technology designed and manufactured the DJ multi touch mixing and control surface for the international live performance DJ market. The system became world famous overnight when used in a concert in Earls Court, London with a huge 74 inch touchscreen. Building on this success the Holo-Info-Desk has now been developed for companies to use at trade fairs and was used by ElectronicsAuckland members to provide an interactive display of electronics capability at the technology showcase held in The Cloud during Rugby World Cup 2011. Actronic Technologies creates electronic measurement and control products and software – productivity solutions that endure and perform in some of the world’s most rugged environments. Their hydraulic weighing systems, conveyor belt scales, and specialised log-harvesting products are in use throughout the Americas, Europe, Australasia and China. Actronic has grown in all markets this year and has been busy adding staff and collaborating with other cluster members to meet this demand. The 2011 year has been very positive for Autogrow. 1)	Won the ANZ exporter award which was part of the Business.govt.nz flying start competition. The prize is being used to fund a trip to China for the official opening of a new large farm using our equipment. 3)	Have achieved local government endorsement for our products in two states within China. This allows farmers to apply for a significant government subsidies to promote the adoption of modern technology. 5)	Obtained an undergraduate Internship grant from MSI for the development of a new product. Autogrow focuses on providing a reliable product with high functionality and ease of use. This strategy is obviously working and building our reputation and brand. One of our overseas distributors who had previously expressed interest in re-branding our product now tell us that the Autogrow brand is so well regarded that they no longer wish to change. We expect revenue to rise dramatically over the coming years with our new product range and new distributors. Look for the full Autogrow story here. The NZ 2011 Business Club is working with local and international business people to get them together during Rugby World Cup 2011. The first invitations have been sent out, but it is not too late to get involved. Join the NZ 2011 Business Club. There are separate categories for international visitors seeking contacts here and New Zealand companies wanting to make new overseas connections. There is no cost to join and it only takes a few minutes. Also look at the Rutherford Innovation Showcase. There are a number of events from 8 September to 13 October 2011. Electronics Auckland will be taking part in the South Pacific Entrepreneur Networking Event on 27 September 2011. Many of the trade offices are organising events in New Zealand in September and October. UK Trade & Investment (UKTI) along with the British High Commission will be hosting an event for UK business people and New Zealand companies on Thursday September 29th at The Cloud on Queens, Auckland. Please contact Hamish Jenkin for further details: hamish.jenkin@fco.gov.uk. See UTKI September 29 2011 Business Networking Event – Rugby World Cup 2011 for more information. We look forward to seeing you in Auckland in September and October 2011. New Zealand’s best kept secret will launch during the Rugby World Cup to an unsuspecting audience. Whilst the nation was transfixed with the earthquakes rattling Christchurch, technology innovator Kevin Andreassend was creating a rumble a world away throughout the international DJ community. The magical interactive DJ virtual reality screen known as The HoloDesk, has captivated the imagination of 100′s of DJs worldwide including some of the biggest names in the industry. The HoloDesk is 1 of 28 New Zealand companies and technologies exclusively invited to be featured during the Rugby World Cup 2011 at the multi million dollar Fan Zone called The Cloud on Auckland’s Queens Wharf. The HoloDesk will be on display and used throughout the 6 week international event. In addition it will be featured in the NZ innovation music video currently in production that will be played on the twin 20m x 4m LED screens within the complex. In addition it has been selected as one of the display surfaces in use at the Telecom Hub operating during the Rugby World Cup event in Auckland New Zealand. Founder of HoloDesk, Kevin Andreassend, described that HoloDesk is at the start of a revolution that is aimed at dance floors and parties and clubs around the globe and delivers a visual arsenal for DJs worldwide. HoloDesk made its UK debut with Deadmau5 at his Earls Court sellout concert amidst the 2010 winter blizzard that closed Europe down. The magical DJ virtual reality screen known as The HoloDesk has captivated the imagination of 100’s of DJs worldwide including some of the biggest names in the industry. The developers of The HoloDesk is ICE AV Technology Ltd, a member of the AucklandICT technology industry sector. 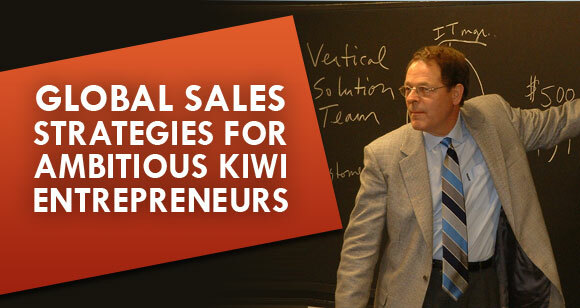 Ken Morse brings a powerful new workshop to New Zealand – Global sales strategies for entrepreneurs. Ken teaches sales techniques that will become the foundation of your company’s profitability. Learn the secrets of forming strategic customer relationships that deliver outstanding sales! Global sales strategies for entrepreneurs – a 2-day workshop for CEOs and top salespeople, to be held in Auckland (2 & 3 May) and Christchurch (5 & 6 May). Ken Morse is a leader in the field of innovation and global sales. Ken founded 5 highly successful high-tech companies and was managing director of the MIT Entrepreneurship Center Massachusetts. He is a Board member of venture capital and technology firms in several countries and is a member of President Obama’s Council on Innovation & Entrepreneurship. In this workshop participants learn how to get a laser focus on customer value, how to prepare a compelling elevator pitch that hits the key points in seconds, and how to close the deal. Learn how to align everyone in your company to create a totally sales-focused culture, and form customer relationships that bring competitive advantage. “This workshop is outstanding – participants came away with a deep understanding of how to communicate value in the selling situation and successfully close the deal” – Sir Ken Stevens, Chairman & MD Glidepath. This is an outstanding course which challenges your assumptions and gives you some practical tools that you can apply right away.” Simon Fawkes, Business to Markets Ltd.
Get more information or register at www.entrepreneurshipnewzealand.com. The deadline is 27 April 2011. New Zealand: A world of hi tech innovation and leadership. RWC 2011 brings together NZ’s hi tech industries to engage with the 1,000’s of visitors NZ will host.